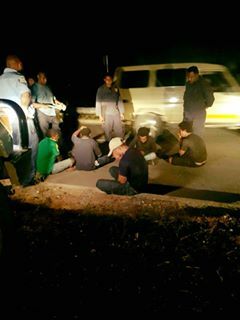 NCD police intercepted a vehicle during one of its random patrols along the Gerehu/9mile back road in Port Moresby at around 8pm tonight only to find thugs in that car who were on a robbery mission. Sergeant Ludwig Dondo of the NCD Police Dog Unit said there were 5 occupants in the vehicle and were in possession of a home made rifle. "They were going on a robbery mission but failed and were returning from 9 mile when we stopped them and searched their vehicle at the round about next to the Morata back road." Sgt. Dondo said. The thugs are believed to be from around Burns Peak area along Hohola Freeway and could have used the back road to avoid police citation. NCD police have continued to patrol the back road because of access by criminal elements for quick getaways as lights have not been installed along that stretch of road. The Dog Unit was assisted by Hohola police to apprehend the criminals who will be charged and locked up.